"Beans and greens are a perfect combination, earthy and satisfying. 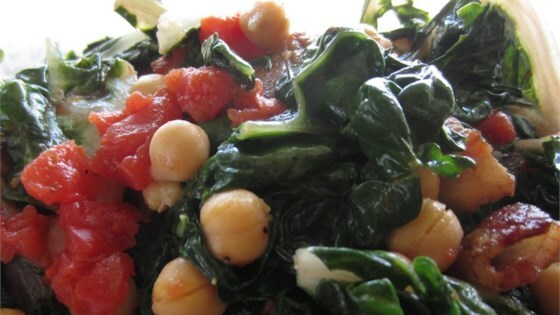 This recipe for Swiss chard with garbanzo beans, onion, and fresh tomatoes is brightened with lemon juice and makes a perfect vegetarian main dish or a tantalizing side dish for fish or meat." This was only so so. Definitely needed more chick peas. Even with them, it was bland. If I try to make this again, I might add more spices. It was just boring. This is excellent. So wholesome! I mixed in some goat cheese near the end, and make this side dish a meal! I also used canned tomatoes. Very tasty! I took the suggestions to add extra garbanzo beans, garlic, and onion, and it turned out great.